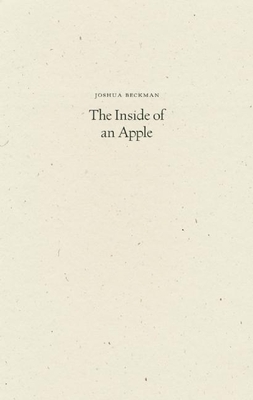 Joshua Beckman is at his most immediate, attentive, and available in The Inside of an Apple. Beckman's latest collection of sincere, spare poems invites the reader to experience a revelation of consciousness and a generosity of spirit. and up it kept on going. Joshua Beckman is the author of nine books, including collections of poetry, translations, and collaborations. He is the recipient of numerous awards, including a NYFA fellowship and a Pushcart Prize. He lives in Seattle and New York. Joshua Beckman was born in New Haven, Connecticut. He is the author of nine books, including the forthcoming The Inside of an Apple (Wave Books, 2013), Take It, Shake, Your Time Has Come, and two collaborations with Matthew Rohrer: Nice Hat. Thanks. and Adventures While Preaching the Gospel of Beauty. He is an editor at Wave Books and has translated numerous works of poetry and prose, including Micrograms, by Jorge Carrera Andrade, 5 Meters of Poems (Ugly Duckling Presse, 2010) by Carlos Oquendo de Amat and Poker (Ugly Duckling Presse, 2008) by Tomaz Salamun, which was a finalist for the PEN America Poetry in Translation Award. He is also the recipient of numerous other awards, including a NYFA fellowship and a Pushcart Prize. He lives in Seattle and New York.